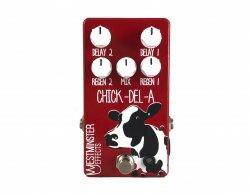 It's our pleasure to present the Chick-del-A, a delay pedal that runs two PT2399 delay chips in series, creating ambient soundscapes emulating multi-head tape delays with plenty of wash (750ms maximum delay, 600ms maximum clean repeats). The Chick-del-A features individual delay times and feedback controls on each chip, has tails, and, yes, works on Sunday. Measurements: 4.8" x 2.6" x 1.4"
Mix - Controls the volume of the repeats. Regen 1 - Controls the number of repeats in the first delay chip. Max this out with a high enough mix control for some crazy, oscillated sounds. Regen 2 - Controls the number of repeats in the first delay chip. max this out with a high enough mix control for some crazy, oscillated souunds. 9V Center Negative - Using anything else will ruin your pedal and VOID THE WARRANTY. Consumes 32mA. All Westminister Effects carry a limited lifetime warranty for pedals sold within the United States and a one-year warranty for pedals sold internationally, for workmanship and components. The warranty does not cover misuse or damage due to accidents. Tampering with components such as trimpots voids the warranty.